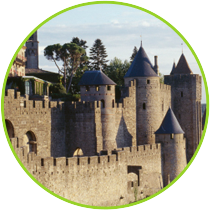 Carcassonne is one of the most visited destinations in France, unmissable for its medieval town, deemed a world heritage site by Unesco (like the Canal du Midi, the second listed site in the Minervois area). 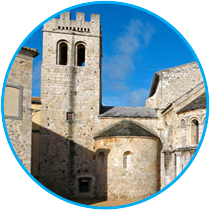 The medieval town, largely restored in the mid-nineteenth century, attracts not only tourists but film makers seduced by the beautiful setting. Towards the east, entering into the vineyard of the Minervois, and following the Canal du Midi, don’t miss the natural, geological surprise of the étang de Marseillette, a protected wetland famed locally for its production of rice and apples. Snuggling into the foothills of the Montagne Noire, this destination is a gateway to the valleys of the Orbiel, the Clamoux and the Argent Double. 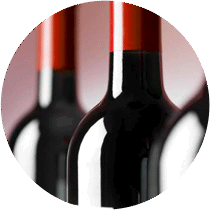 This is a territory rich in natural and built heritage, with, in particular, the Grotte de Limousis, the Gouffre de Cabrespine, the Maison de la Truffe, the Châteaux de Lastours and the Moulin de Villeneuve-Minervois. This magnificent mountainous countryside is well served by a warren of walking paths. You can wander in this medieval village – its narrow backstreets and its sumptuous romanesque abbey – and visit the famous red-marble quarries of Caunes-Minervois, whose stone is found as far afield as the Palace of Versailles. 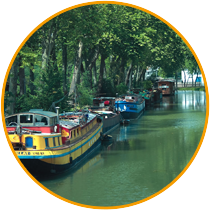 Near the beautiful city of Narbonne, after a stop at the Musée Amphoralis (amphora museum) in Sallèles, the Canal du Midi, listed as a world heritage site, punctuates the Minervois over more than 60km, joining together these two charming villages. Le Somail (famous for its old bookshop) was a port of call for the postal barge that joined Toulouse to Agde. On the road to Homps, in the shade of plane trees and parasol pines, you discover the unique legacy of Pierre-Paul Riquet, achieved in the eighteenth century. 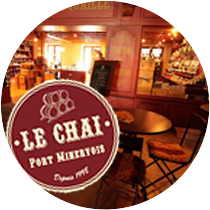 Then, on the quays of the port, the House of Wines and Winemakers from the Minervois welcomes you with a comprehensive range of local products. To do: the Canal by barge. Coming from Bize-Minervois, you pass through La Caunette, a village nestled at the foot of an impressive cliff, pierced through with caves. Don’t hesitate to take a break on the village square, with its pleasant cafe. Then on to Minerve, located at the heart of a limestone plateau, hollowed out by deep gorges. 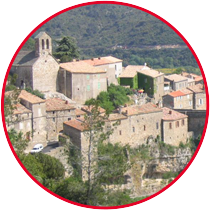 The town, which has given its name to the whole region, underwent a vicious siege during the Albigensian crusade in 1210. Conquered after seven weeks, the Cathars taking refuge there were burnt alive. If you go down into the riverbed of the Cesse, you will find two splendid natural bridges, hollowed out by the river over the course of thousands of years. 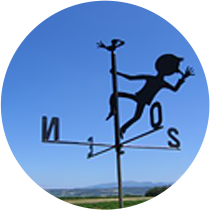 Farther again, in the direction of Siran you will come to a plateau dominating the entire plain of the Minervois, which provides a magnificent view as far as the Pyrenees. Explore the variety of the countryside and its villages via the walking paths and heritage trails. 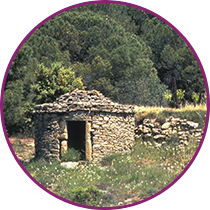 When entering the Minervois from Béziers, Bize and the hamlet of Cabezac invite you to discover the olive oil production in the Oulibo cooperative, with its ‘Odyssey of the olive tree’ attraction. This village is an ancient human settlement; bone fragmetns several thousands of years old were discovered in 1820 in a nearby cave. 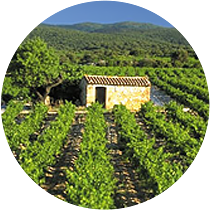 A charming community on the banks of the Cesse, with a bathing-spot much appreciated in the hot summer afternoons, Bize-Minervois is also your portal to the exceptional wine-growing land of the Plateau de Cazelles and the Muscat of Saint-Jean-de-Minervois, farther to the north. 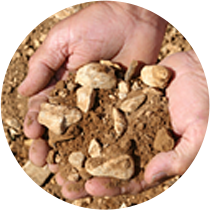 Just down the road, Mailhac perpetuates the traditions of Iberian potters who were present in 6 B.C.